for a confidential on-on-one conversation with a trained WHN specialist who will find a good provider match for you. From all of us at the Invictus Foundation we extend to you our heartfelt gratitude for your service and sacrifice in defense of this Nation and in joyful celebration say to you; Welcome Home! 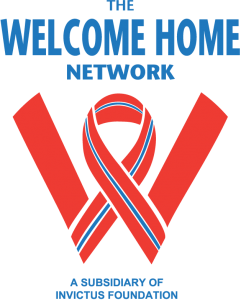 The Welcome Home Network (WHN) is a referral source for non-urgent behavioral health issues affecting our military members, veterans and their family members. Should you or a family member be in need of urgent behavioral health care services, urgent being defined as being a threat to yourself or others, please call the Veterans Administration hotline at 1-800-273-TALK (8255). We have given a great deal of thought as to how we wanted to differentiate the WHN’s behavioral health services matching system from all others. Simply stated we’re going to do it by providing military/veteran-centric, concierge-level service for you and your Family. We will do so by the manner in which the human interface represented by Invictus Foundation personnel interfaces with the algorithmic branch chain logic of the back-end computer matching process when you want to schedule an appointment. We want to be positioned as your pathfinder in locating and making the most suitable match between you, your Family, and the provider. Finally, please remember the Welcome Home Network is a continual work in progress. Our provider inventory is dynamic and constantly growing. We are recruiting behavioral health providers to the WHN on a daily basis. Should you find no suitable zip code matches for your needs we urge you to call us toll free at 1-855-544-PTSD (7873) or locally at 425-228-0419. We will find an appropriate match for you. In closing, our efforts are and will remain solely focused on contributing to our Nation’s military, veterans and their families who have given so selflessly of themselves to us and replace despair and disconnectedness with hope, resiliency and recovery from the invisible wounds of war.